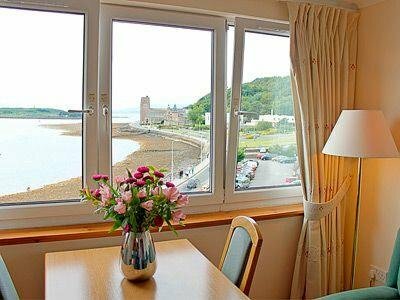 Ideal base for visiting the IslesEsplanade Court is situated in a particularly superb location overlooking Oban Bay, on the lovely west coast of Scotland. The holiday apartments have qualified for the STB 4 Star rating. They are equipped and furnished to a good standard with each one having a panoramic view over the bay and out to the isles of Kerrera, Mull and Lismore. Oban is a lively west coast town with lots going on for the visitor. It is central for touring the west coast, or take a boat trip to the above islands and Iona which leave daily. There is a lovely sandy beach at Ganavan which is 1½ miles away. There are some very good restaurants in which to eat dinner in the evening, after maybe a days climbing, walking or enjoying some of the wonderful animal and plant life which the west highlands has to offer. Elevator to all floors.Lift to entrance. Bathroom: With bath, shower attachment and toilet.Cot. Private parking for 1 car. All properties: Electric heaters, electricity, bed linen and towels inc. Highchair. Shared laundry room with coin-operated washing machine and tumble dryer. Payphone (shared). Wi-fi (in lobby). No smoking. Visit Scotland 4 Star. Be the first one to tell us about your rental experience while staying at Esplanade Court - Apartment. Let us know if the listing matched your expectations. You can share your comments about the location, property owner/manager and all the unique features that made your stay a memorable one.